Ahmed F, Ganie MA, Shamas N, Wani M, Parray I. Hiccup: An Extremely Rare Presentation of Thyrotoxicosis of Graves’ Disease. Oman Med J 2011 March; 26(2):129-130. Chronic hiccup is defined as an attack lasting longer than 48 hours and, sometimes it can be serious, intractable and exhausting. Persistent Hiccup (PH) is rare and it can be idiopathic or a symptom of a variety of diseases. The hiccup center may be activated by a great variety of stimuli travelling along different nerve pathways and a reflex arc has been proposed, with the phrenic nerves, vagi, and T6-12 sympathetic fibers as the afferent limb.1 The "hiccup centre" is thought to be located in either the brainstem respiratory centre or the cervical cord between segments C3 and C5.2 The efferent limb is the phrenic nerve.3 It has been suggested that hiccups could be a form of myoclonus, caused by repeated and abnormal activity of the solitary inspiratory nucleus.4 We present a case of Graves’ disease which had defaulted with drug treatment and presented with PH. The patient had impending thyroid storm and its treatment resulted in remission of hiccup. We hypothesize that hyperthyroxinemia caused the irritation of the hiccup centre that resolved after taking care of hyperthyroxinemia. This case highlights a rare presentation of severe thyrotoxicosis. A 55 years-old male, chronic smoker, shopkeeper by occupation diagnosed case of Graves’ disease with moderate ophthalmopathy was on our follow-up for the last 12 months. He was stabilized on carbimazole 20 mg a day for two months before the current admission, when he defaulted with the medication. He started with persistent and non responding hiccup for 10 days (i.e. two months after drug withdrawal). The frequency and intensity of hiccups worsened with time and were almost present throughout the day and night at the time of admission to the emergency room of the hospital. There was no history of drug intake known to cause hiccups, abdominal pain, and chest pain, as well as symptoms pointing to a mass or sepsis in the chest or abdomen. On examination, the patient was ill looking, confused, disoriented, diaphoretic and moderately emaciated with a BMI of 19.4 Kg/m2. Vitals in ER revealed moderate fever (103.5°F), severe tachycardia (pulse of 122 bpm), and a wide pulse pressure (BP 130/60 mm Hg). He had diffuse, soft to firm thyromegaly with bruit over it. Eye examination revealed that both were hyperadrenergic and mechanical (bilateral proptosis) components of ophthalmopathy were indicative of activity. The rest of the systemic examination was unremarkable. 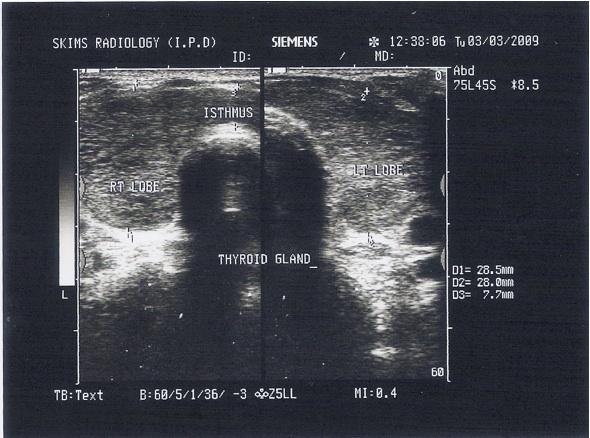 Figure 1: USD Thyroid showing diffuse enlargement of the thyroid. Hiccups are an involuntary spasmodic and coordinated contractions of the inspiratory muscles associated with a delayed and sudden closure of the glottis which is responsible for the characteristic noise.1Hiccups are a common benign disorder, which are usually transient. Occasionally, hiccups fail to resolve spontaneously, resulting in patient fatigue, incapacitation and the need for the affected individual to seek medical care in order to resolve the problem. The approach to the management of these patients consists of the identification and treatment of serious underlying causes of the episode as well as therapeutic interventions to achieve hiccup resolution. Chronic Persistent hiccup is defined as one lasting more than 48 hours, which is uncommon, and Graves’ disease presenting with hiccup is rare.5 It can be serious, intractable, and exhausting, and its cause often obscure. It may indicate multiple neurologic and extra neurologic disorders such as brain tumor, strokes, myocardial infarction, renal failure, prostate cancer, or abdominal surgery. Psychogenic causes (excitement, stress) may also elicit hiccups. Detailed medical history and physical examinations will often guide diagnostic investigations (abdominal ultrasound, chest or brain CT scan). Gastric and duodenal ulcers, gastritis, esophageal reflux and esophagitis are commonly observed in chronic hiccup patients and upper gastrointestinal investigations such as; endoscopy, pH monitoring and manometry should be included in the diagnostic evaluation systematically. Most episodes of hiccup are associated with acute gastric distention and alcohol ingestion, but these are short lived and resolve spontaneously.6 Etiological treatment is not always available and chronic hiccup treatment has classically relied on metoclopramide and chlorpromazine. Recently, baclofen has emerged as a safe and often effective treatment.5 To the best of our knowledge; this is the first case which highlights hiccup as one of the rare presentations of thyrotoxicosis. In this report, we attempted to rule out most of the usual causes of hiccup and most of the evaluation was negative. We assume that irritation of the hiccup centre by high levels of thyroxine resulted in persistent hiccup since it was the treatment of thyrotoxicosis, which resulted in its resolution. It was not the steroid effect as he continued with hiccups even on steroids, and by day three, the hiccups stopped completely, which also corresponds to the normalization of serum T3 levels. Also, the fact that the patient had no recurrence of the symptoms in the euthyroid state and no other cause was evident after a long follow up of 18 months further confirmed our hypothesis. We report this case to highlight this rare presentation of thyroid storm/severe thyrotoxicosis. It emphasizes to practitioners that it is important to thoroughly investigate a case of hiccup to identify any underlying pathological cause with due consideration to hyperthyroxinemia/thyroid storm as in this case. 1. Noble EC. Hiccup. Can Med Assoc J 1934 Jul;31(1):38-41. 2. Salem MR, Baraka A, Rattenborg CC, Holaday DA. Treatment of hiccups by pharyngeal stimulation in anesthetized and conscious subjects. JAMA 1967 Oct;202(1):126-130. 3. Baraka A. Inhibition of hiccup by pulmonary inflation. Anesthesiology 1970 Mar;32(3):271-273. 4. Moretti R, Torre P, Antonello RM, Ukmar M, Cazzato G, Bava A. Gabapentin as a drug therapy of intractable hiccup because of vascular lesion: a three-year follow up. Neurologist 2004 Mar;10(2):102-106. 5. Launois S, Bizec JL, Whitelaw WA, Cabane J, Derenne JP. Hiccup in adults: an overview. Eur Respir J 1993 Apr;6(4):563-575. 6. Moretti R, Torre P, Antonello RM, Nasuelli D, Cazzato G. Treatment of chronic: new perspectives. Eur J Neurol 1999 Sep;6(5):617.